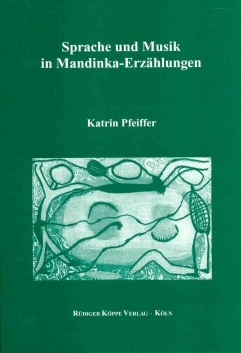 Author: Katrin Pfeiffer. Series edited by: Wilhelm J.G. Möhlig. The topic of this present interdisciplinary study of oral literature and musicology concerns the fictional narratives of the Mandinka of Gambia. The texts known as Taalin are orally transmitted and contain the norms and values of Mandinka society in the guise of entertainment. Therefore the book offers, apart from its analytic results, valuable insights into many aspects of this society. Quite often female-specific themes are dealt with in the Taalin, e.g. child rearing and the relations to husband or co-wives. Many Taalin contain songs which play an important part in the process of memorisation because of their textual und musical form. Thus all song examples are given with a musical notation, and they are included on the accompanying audio CD. The focus of the book is on the question of consistency and variance of the Taalin in the specific repertoire of a narrator and between the repertoires of different persons. Against the view that only narratives of one or more ethnic groups should and can legitimately be compared, the author demands a more prominent place for the study of the individual narrators, who regard themselves as artists within a linear literary tradition. The uniqueness of the individual repertoire becomes obvious when closely analysing and comparing the parts sung by the narrator. Apart from the study of these narrative and musical features the results of the 18 interviews were included, which especially provide further information on the strategies of memorising the Taalin. One of the interviews is included in full length, both transcribed in the book and on the audio CD.